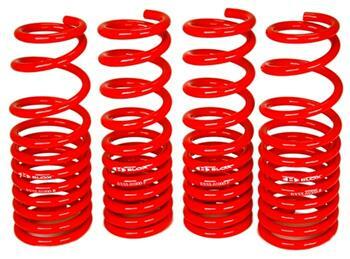 BLOX Lowering Springs - Pann Auto Performance - San Diego largest aftermarket automotive performance parts - What do you drive? All lowering springs are CNC-wound using hot-rolled SAE 9254 spring steel to ensure quality and performance. These progressive rate springs are then subjected to heat and shot peen treatment, protecting them against deformation and greatly increasing high fatigue endurance. 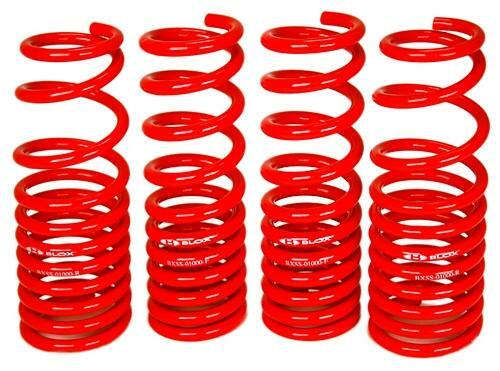 All springs then undergo powder coating for durability and rust resistance. The vehicle’s center of gravity is lowered improving driving response and increasing stability, while reducing the effects of nose dive under hard braking and minimizing body roll through hard cornering. BLOX Racing lowering springs are engineered to lower your vehicle properly and safely while still maintaining proper suspension travel. Competition Series lowering springs offer drivers racecar like handling and maximum performance without sacrificing quality. NOTE: Designed to properly fit BLOX Racing shocks or other OEM-length shocks. Will not properly work with shortened-shock bodies.